Pink Heart String: Will Technology Make Teachers Jobless? Will Technology Make Teachers Jobless? Teachers will always be the pillar of learning- the main pillar of sound society because without proper education, we might merely be cats and dogs. Aside from parents, teachers help mold every individual who needs their help. We have encountered teachers ever since we were toddlers. There were those patient nursery teachers and kinda strict college professors. But whatever their approach in teaching are and whatever characteristic they have, what makes them all common is that they remain as a source of knowledge and values especially for the younger generation. Have you imagined a world without teachers? Hmmm....I wonder how it would be like if there were no teachers at all! Maybe people will think that what they know are always right because there are no longer teachers who can tell us that 1+1=2 and not 1+1=11. There would be confusion as to what is right and what is wrong. Maybe teens could even be crazier or would come out either too smart or too dull. lol. Well, with the latest technology and the internet, we could actually learn merely by reading and watching videos. But there is a difference between learning through technology and have someone to teach you. Having a teacher or a tutor would make learning easier because of the personal interaction you have. Explanations can even be simplified based on how you could understand it. The information you can get from the internet is helpful but it can never be simplified nor altered the way you want it. Some people recognizes the idea of no longer having teachers because of the technology we have. Kids can learn through it and are said to be even more smarter. In teaching Bella, I use the internet to show her educational videos but along with that, I also teach her what those things are. It isn't good to just let them watch, expect them to learn and just drop it. It is always important to review the kids on what they have learned and even guide them so they can understand what they are seeing. If you fail to do that, your kids might end up confused or worse, they might have a different interpretation or understanding of what they have seen. This is also true to educating others using technology. It is good to use technology in teaching but do not solely let technology teach the kids. These information we get from the internet along with the hi-tech gadgets we can use can be instruments for teaching. It actually makes teaching easier but we retain the teachers. 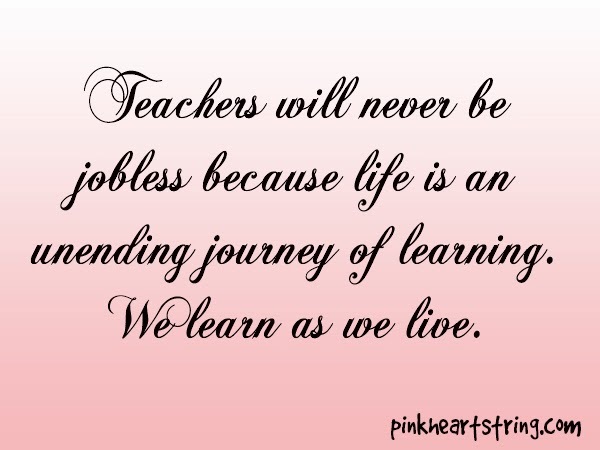 Teachers are people who will remain because life is an unending journey of learning. We learn as we live. Teachers will live as long as we learn. Despite the advancement of technology, teachers can still continue educating others using those advanced formats. They can still be great teachers even if the classroom format becomes obsolete. There are many online teachers these days which means that their scope of teaching is broader than ever. This gives teachers more opportunity to help others. I actually saw an article online talking about the possibility of having a world free of teachers. It pointed out that Kindles and other hi-tech gadgets can already teach the kids what they need to learn and we can do away with those teachers who wag their fingers in front of our kid's face. It was kinda lengthy and I didn't finish reading it because it actually projected a future without teachers but with smarter who learn on their own. Since I didn't agree with the idea, I stopped reading it. lols. I still believe that teachers are important and will remain important even if that time comes when research can be done through hologram technology. I salute all the teachers around the globe especially those who have made me into who I am today. I am forever grateful. 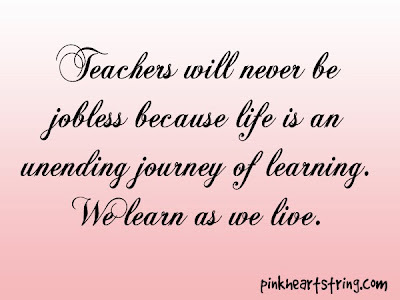 :) Teaching is indeed a humble and rewarding profession. I once taught college students before I took the Civil Engineering Board Exam. Even if it is tiring sometimes, it is still worth it when the students come of the room fueled with new knowledge. So, what do you think? Will technology make teachers jobless? wow.. this is a thought provoking post. I have never thought of such a scenario before. Well, I think technology will never lead to a world without teachers because they are really something larger than life and technology. Teachers might rein the aspects of technology and might still be able to teach the students the intricacies of it. Interesting... definitely something to think about!! We were just having a conversation about this on a playgroup board and one mom was discussing how she found out that 2 hired teens at their restaurant and one can't tell time on a analog clock and another can't figure out change without a calculator. She interviewed two other teens and both didn't know the name of coins but at least could make correct change. We've chosen to homeschool, but I hope technology doesn't replace teachers. We do use technology to expand on some of our lessons, but it doesn't doesn't replace most of what we do. Reading books on the iPad just isn't the same as flipping the pages of a book with little ones! Haha Technology can be a great resource, but it definitely doesn't replace what a great teacher brings to the learning experience. "It is good to use technology in teaching but do not solely let technology teach the kids." I LOVE this!! I finished both my college degrees online ... but we still needed a TEACHER! ;) Someone to really guide us through the material and ask us the tough questions. Great post. Great post! Nothing can replace human interaction, don't think Apple or Google can replicate that. Technology is like a double edged sword, it's a great tool to use but too much of it or it being used in a bad way causes bad results.